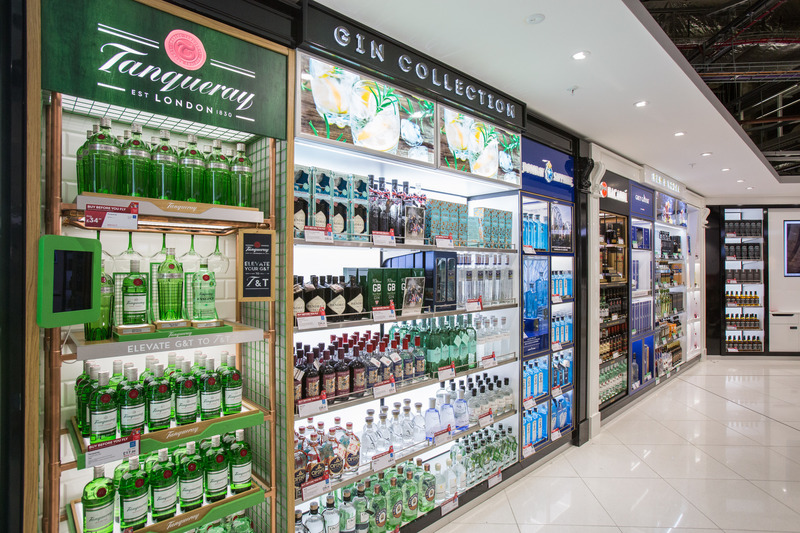 There was a time when the gin offer even at large UK airports was limited to well-known brands such as Gordon’s, Beefeater, Bombay Sapphire and Tanqueray. There’s nothing wrong of course with these tried-and-trusted favourites, but the more adventurous gin lover was invariably left disappointed by a visit to the duty-free store. Thanks to the boom in craft gins, that’s no longer the case, I am pleased to say. A case in point is Word Duty Free’s giant new walk-through store at London Gatwick’s North Terminal, which officially opened in December last year. The spirits area features a whole wall-bay dedicated to gin called the Gin Collection. The best-selling variety there is the local Surrey-based Silent Pool gin, which is produced on the Duke of Northumberland’s scenic Albury Estate. It takes its name from a spring-fed lake on the estate, which according to legend is haunted by a young girl who drowned in it after being discovered swimming by Prince John. Silent Pool is a fresh, floral 43% ABV gin with a complexity in flavour that comes from its 24 botanicals, including several such as elderflower, chamomile, pear and honey, which are sourced locally. Other botanicals include the essential juniper, angelica, bitter orange and kaffir lime leaves. The clear, aqua-green bottle is stunningly beautiful, featuring gold illustrations of all 24 botanicals used to make the gin. A 1-litre bottle of Silent Pool at World Duty Free (WDF) is priced at £43.50, but those searching for a gift should consider the higher-priced £51.99 Gift Set, which contains a 70cl bottle of Silent Pool and two copa glasses illustrated with the same design as the bottle. It’s worth noting that Silent Pool is now also available at London Heathrow, Edinburgh and Southampton airports. Other craft gins at Gatwick’s new Gin Collection include Thomas Dakin, a small-batch gin from Quintessential Brands, the owner of Greenall’s. Packaged in an 18th century-style bottle with Victorian-style lettering, Thomas Dakin is named after an early pioneer of quality gin distilling. Priced at £24.49, it is a classic, juniper-driven gin balanced with 10 other botanicals including English coriander, angelica, grapefruit, and red cole, a savoury root botanical. Then there is the award-winning Shortcross Gin (on sale at £34.49 for 70cl), which hails from Northern Ireland’s County Down. Produced by husband-and-wife-team Fiona and David Boyd-Armstrong on the historic Rademon Estate, this is a labour of love with locally foraged botanicals – green apple, elderflower and wild clover – and small-batch distillation. Even the bottling and labelling is done at the Estate. On the nose, there is piney juniper and orange peel, while the palate offers vanilla, nutty angelica and floral notes coming from the elderflowers and elderberries. Soft, elegant and nicely packaged with a wax-dipped bottle and a label featuring a brand stamp inspired by an old Irish coin, this would make a great gift for any gin lover. From London Gatwick we hop a short distance to south-coast-based Southampton airport where World Duty Free has listed the locally made Mermaid Gin. Produced at the Isle of Wight Distillery and priced at £33 (70cl), Mermaid Gin features 10 botanicals, including locally foraged rock samphire and elderflower, Boadicea hops grown in the Isle of Wight’s Ventnor Botanic Gardens, and Sussex coriander. Mermaid Gin is slow-distilled with only around 55 per cent of the distillation bottled, which the distillery believes results in the right balance of citrus flavours which peak in the first part of the distillation. Conversely, stewed flavours that occur towards the end of the distillation are avoided, creating a smooth, refreshing gin with a citrus kick and a long finish. The distillery suggests seasonal berries, a slice of cucumber and even a sprig of samphire make for ideal garnishes for a G&T made with Mermaid Gin. Craft gins such as Mermaid, Shortcross and Silent Pool are adding a welcome local touch to airports across the UK. Long may that trend continue.